This airticle is aboot the toun in Jõhvi Pairish, Ida-Viru Coonty. For the veelage in the same pairish, see Jõhvi veelage. 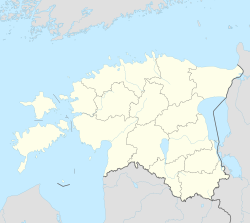 Jõhvi (German: Jewe, Roushie: Йыхви) is a toun in north-eastren Estonie, an the caipital o Ida-Viru Coonty. The toun is a admeenistrative centre o Jõhvi Pairish an aw. It is situatit 50 km frae the Roushie border. Ethnic Estonies are a minority in Jõhvi, as aboot 55% o the toun's population are ethnic Roushies. Wikimedia Commons haes media relatit tae Jõhvi. This page wis last eeditit on 16 Mairch 2017, at 18:04.